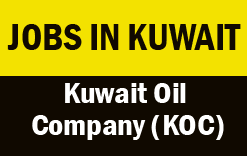 The Kuwait Oil Company (KOC) is an oil company headquartered in Ahmadi, Kuwait. It is a subsidiary of the Kuwait Petroleum Corporation, a Government-owned holding company. Kuwait was world's 10th largest petroleum and other liquids producer in 2013, and fifth-largest exporter in terms of volume of crude oil and condensates. The managing director of the company is Jamal Abdulaziz Jaafar. Jobs in Kuwait: Kuwait, an Arab country on the Persian (Arabian) Gulf, has cultural heritage dating back to antiquity. Kuwait City, the capital, is known for its modern architecture, ranging from skyscrapers to the striking Kuwait Towers, water towers whose design recalls the tiled domes of a classic mosque. The Tareq Rajab Museum houses a rich collection of ethnographic artifacts and Islamic art.